As our pace of life gets faster and faster, we find ourselves more and more on the go, and as a result a whole series of electronic paraphernalia is now available. Some of these devices run on rechargeable batteries, others on traditional ones, especially Game Boy devices and the like. Let's take for example the Game Boy: one Game Boy console can run for 10 hours with 2 batteries. Even if your kid plays for only an hour a day, it would still amount to 73 batteries being consumed in a year. And yet, it is a known fact that batteries contain dangerous chemicals such as mercury, lead, acids, etc. What a financial and ecological waste it would be to consume this many batteries. Invest in a good battery charger and some rechargeable batteries, preferably high-capacity types (at least 200mah), once and for all. 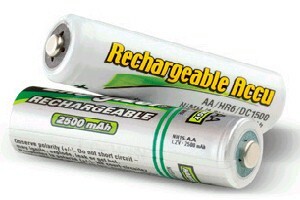 Each battery can be recharged several hundreds of times; therefore, once you own four or five of such batteries, you will never have to buy new ones again (at least, not for many years to come and only when your rechargeable batteries have run down). Finally, from a purely ecological point of view, a rechargeable battery pollutes 10 to 50 times less over its lifetime than a traditional battery on average.